Whether you are reading this post in your inbox or on my website, I hope my post finds you well! I am so excited to share that I completed my 8 week cross training challenge with Scorch, and also just finished my body composition testing with Dr. Reena Newton at Get2Knowyourbody! I am perfecting that post with Dr. Newton (making sure I have all data explained correctly) and will share it with you soon! I have been wanting to post something about this for a couple of weeks, but trying to find the best way to phase it, the best way to even bring it up. Guys: deciding to move to a new city, buy a house, plan a wedding and buy a fitness studio all in the same year may not have been the best idea. Don’t get me wrong: I am basically the luckiest girl in the world, and I feel like I’m getting everything I’ve ever wanted ALL AT ONCE. But that’s the problem… It’s all at once! I haven’t had the chance to savor any of these transitions or really even reflect on what is going on around me because it’s just been SO much change all at once. All I’ve felt lately is overwhelmed and homesick for Chapel Hill.. and the life I used to have just 9 months ago. And I feel so guilty for feeling this way. There it is. I said it. And I feel better already for sharing this with you. I am 5 weeks away from my wedding and struggling to be able to fall asleep at night. My hair has started thinning, I found myself losing weight and out of nowhere (in a yoga class) I popped something in my shoulder and I think I may have strained or pulled something in my rotator cuff. I know the signs of anxiety and stress.. but unless you are looking for it; sometimes you don’t realize it until it’s ridiculously obvious. This is not how I want to feel just 5 weeks out from the big day, and it’s not how I want to feel any day of my life. I’ve decided to pause my cross training challenge, and begin again with my second fitness format in a few weeks. I think a couple mornings sleeping in past 6:30AM will do me some good, and maybe a couple of extra puppy cuddles with Indy. I want my blog to be about both Fitness and Wellness in pursuit of foraging a healthy and happy lifestyle. I also want to be very honest with you, and honest with myself. I know that I never want to feel this drained and exhausted ever again, nor do I want it for friends nor family. I’m currently researching all of the best methods of self-care I can find: yoga and meditation, Aryuveda practices, and Hygge. I will share with you what I try, and what works for me. I also plan to take my experience and put together a toolkit for “brides to be”. I’d like to eventually make a curriculum and training plan for anyone getting ready for their “big day” or any other special events and help them feel not only confident with how their dress fits, but also feel energized and confident as they take on all that is a part of wedding/ special event planning. Make time for you. 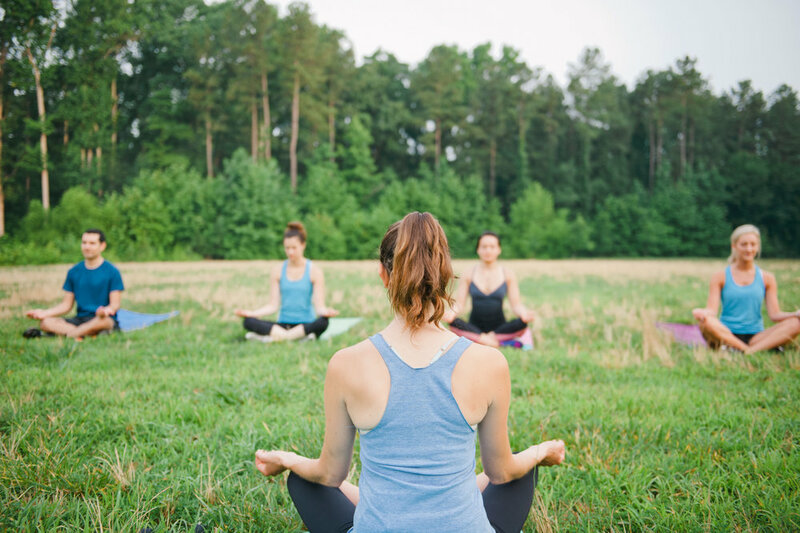 Whether that’s meditation, a yoga class or something entirely different. SO: if you are feeling stressed out, anxious, alone, overwhelmed or all of the above: know that you are not alone. Do not feel guilty for carving some time out for yourself, and don’t be afraid to ask for help. I trust that all of you totally understand my need to take a mini break from my fitness challenge. I’ll pick back up in a month, and I’ll post results from Scorch later this week guaranteed! Thank YOU for your constant support. Comment below! What do you do to take care of yourself? I’ve been taking notes and journaling every weekend for the past month, documenting how I feel at the end of each week during my cross-training challenge. I wanted to share with you my first month’s worth of journaling. I’ll have a second post with my final four weeks at the end of this challenge, and include it with my body composition analysis results. Below (in a very informal format) are the notes I took at the end of each week! It includes the number of classes (of each format) I attended, if I added anything else into my routine, and my reflections on the week! Week 1: I took 4 Pure Barre Classes and 4 Scorch Classes. I was definitely dedicated and excited to start my first week! I actually feel amazing! Occasionally I mentally struggle at Scorch because they tell you to move as SLOOOOWLY as possible.. like moving INCHES for a minute before switching to a different position and moving inches again. When this is done correctly it’s really effective for tapping into your slow twitch muscle fibers and strength building, but I’m used to incorporating musicality into my workouts and moving “to the beat”. Exercising in a room where everyone is going at a slightly different pace actually really distracts me but I just try to close my eyes or keep my eyes downcast. I’m starting to learn each of the positions’ names so when the teacher says on the mic what the next move is, I’m able to transition more quickly. This takes a while so anyone new to Lagree: be patient. It was really cold outside all week, so this was the perfect way to keep me really active (but) inside. I’m feeling good, and my core muscles (obliques especially) are really sore! Week 2: I took 4 Pure Barre Classes, 3 Scorch Classes and added 2 (30 minute) cardio bouts: 1 run and 1 elliptical workout. Okay now I’m sore! Both Scorch and Pure Barre are very core-centric workouts so my abdominals are working more than they ever have in a week. I think my posture is improving from the constant abdominal work, and my glutes are working overtime. I will admit that I’ve started to miss cardio. Pure Barre and Scorch both elevate your heartrate: but not in the same way a cycle class/ run/HIIT class can. I think the max heart rate I’ve achieved in either a Pure Barre or Scorch class is around 130bpm, and I hover around 150-165 bpm when I do more serious cardio. I did find myself missing that cardio high so I added the two cardio bouts.just to get the oxygen in my lungs and to feel that mental release of a cardio program. This means that I exercised for about 8 hours this week, which is more than usual for me. If you are a serious athlete that’s nothing, but for me it’s new so I’m adjusting! I’ve been sleeping better, but haven’t noticed a big uptick in appetite nor anything else. I do feel a little “tight” like I need a good stretch, so my goal is to take 1 yoga class a week as well to reset and center my body. Going strong! Week 3: I took 3 Pure Barre classes and 3 Scorch Classes, with 2 (30 minute) runs. I tried to take more of either class format and failed. It snowed mid week so both studios were closed in the morning (which is usually the only time I can exercise). My dad also visited this weekend so I opted for a hike with him instead of a class on Saturday. I noticed this week that I was encouraged multiple times to slide my shoulders down (away from my ears) in Scorch. I think I may be just holding a lot of tension in my neck this week, or maybe I am shrugging my shoulders in an attempt to recruit more muscles to help me with the work. Either way it’s been a good personal project for me and I’m trying to mentally focus on pushing my shoulders down more often in everyday life. The Scorch teachers are very knowledgeable about their technique. I appreciate how patient they are with me, and for all of their hands on corrections. I was able to stay committed to my program this week but the snow and weekend entertaining slowed me down just a bit! I’ve realized that it’s really hard to fit it all in if I take the weekend completely off. Luckily I’ll be in town on most weekends! I’m feeling pretty good! My hamstrings are sore this week! No yoga this week but I tried to make more time to stretch before and after classes. Week 4: I took 4 Pure Barre Classes, 3 Scorch Classes and 2 (30 minute) runs. The only reason why I was able to fit in that fourth pure barre class is because I had to take it.. I’m working with a new teacher and we are practicing together (a lot) until she is ready for her first class. If I didn’t have to.. I wouldn’t have done it. I am SO SORE! Both Pure Barre and Scorch can feature a lot of forearm/straight arm planks, ab pikes and pushups. It varies and depends on the teacher and their choreography choices. I think I just took classes this week when everyone was in the mood for pushups. My core feels really strong this week, and I see more definition in my shoulders than usual. I have to admit: I’m missing working with weights bigger than 5 pounds though. My body is very accustomed to bigger movements and bigger weights.. like a chest press with a barbell for example, or using a squat rack. At Scorch you use the hand cables and mega-former for upper body training, and for Pure Barre the biggest hand weights you use weigh 5 lbs. I know that I’m getting a lot of upper body work from all of the planks, pushups, pulling off the barre and using the resistance cables (at Scorch), but I still find myself missing the gym this week. I am curious to see if I lose or gain upper body strength… I know that there will definitely be some sort of difference because my upper body is absolutely working in a different way than it usually does. Again no yoga classes made it into my schedule… working on it! Okay so those are my notes and thoughts from Month 1 of my Pure Barre/Scorch cross-training challenge! I’m really enjoying this mix and look forward to every class. I’ll have so much more information to you soon! Do you have any questions for me? What are you doing this week to stay active despite this cruddy weather? It’s been longer than I’d like since my last post. The weeks are flying by and I need to catch you up on everything I’m working on! 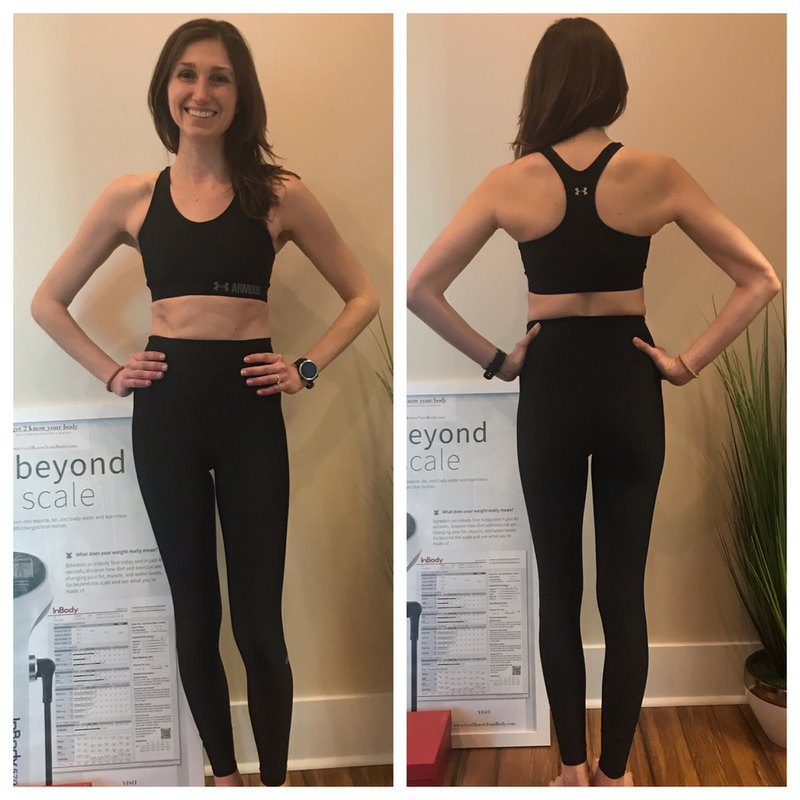 On the first day of my Scorch/Pure Barre cross training challenge I visited Dr. Reena Newton at Get 2 Know Your Body for body composition testing and analysis. It’s really important to get measurements like these as opposed to just stepping on a scale because measuring body weight can be misleading when used as an indicator of health. When I measure the distribution and percentage of body fat and muscle, as well as body water balance, it tells me a lot more about my body’s health and strength. This test will help me measure how the different exercise formats are affecting my body. This is an Inbody570, and it’s incredible! Dr. Newton uses this device to accurately and quickly measure body composition. The following information is from her website: When you step on this machine: safe low level currents are sent through your body via hand and foot electrodes. The current travels throughout your body and encounters the different cells of your body (muscle cells, fat cells, skin cells, etc.) along the way. Every cell has a certain ability to impede (or slow down) the current slightly as it travels on its path to the exit point. By the time the current reaches its exit point it will have lost some of its voltage. The time it takes for the signal to reach it’s exit point is translated into your results. Before my test I had specific instructions: I could not eat nor exercise at least 2 hours before my test, I had to remove my socks, and was asked to use the restroom immediately before my test. The process is simple and quick. You step up on the platform, hold onto the handles with your arms out by your sides, and within a minute I had my test results. I got a full page print out of valuable information about my body composition. Dr. Newton spent half an hour going over all of the data and explaining what all of it meant for me. The most important parts for me and this challenge are the following: my body weight is 120.8 pounds, I am 59.1% water. I have 97.4 pounds of lean body mass, of which 52.7 pounds is skeletal muscle. (Skeletal muscles are the muscles that are most directly affected by exercise and diet). I have 23.3 pounds of body fat. This means my body fat percentage is 19.4%. This is a healthy amount for me. My visceral fat level (fat around my organs) is at a level 4. Level 10 and under greatly decreases risk of metabolic conditions like diabetes and heart disease. Dr. Newton assured me that my results are great and recommended aspects to continue to optimize for healthy body mechanics and overall health. If you are an Asheville local I recommend you visit Dr. Newton! You can visit her website here. Before I left, I asked Dr. Newton to take some pictures of me to serve as “before” pictures. I do just want to add.. I am comfortable in my body and happy with how I look and feel. I have no “trouble” spots I’m trying to fix and my goal is not to lose any weight. I’m just curious to see if I can see any differences in my body shape after every 2 month interval.. I am a strong supporter of body positivity and I hope you are too. 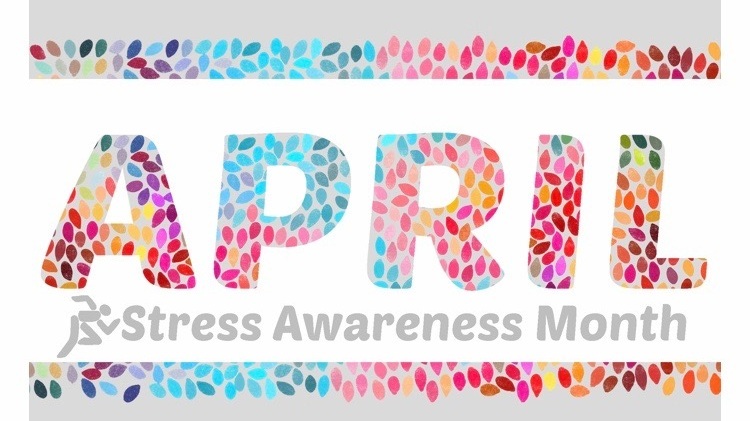 If you struggle with any sort of body image issues message me and I can connect with you some great websites, professionals, books to read and podcasts to listen to. For many (including myself) it takes work to forge a positive relationship with your body and body image, and I’d like to help anyone and everyone who needs help or direction. I have another post coming your way soon! I’ve got an update on my progress with Scorch! I’m halfway through my first challenge and feeling so good about it! I’ll share all of my thoughts and observations thus far next! Stay strong and have a great weekend! Happy New Year! I hope your first few weeks of 2019 have been healthy and happy! But wow… guys! I have been running around like crazy since January 1st. All of a sudden our wedding is around the corner (4 months!) and I haven’t been putting in the prep work I should be.. more on that later though. I’m planning a “Day in the Life” post for later this week, but I wanted to share my progress with you about my year long cross-training challenge! I put a poll up on my Instastory (@handarrowfit) on New Year’s Eve asking you for your input as to what format I should try first for my cross-training challenge. I offered up the options of cycle or Megaformer: and Megaformer won by a landslide. Seventy-eight percent of you wanted to hear more about this method, and also see what happens when I take it consistently for the next two months. So here we go! 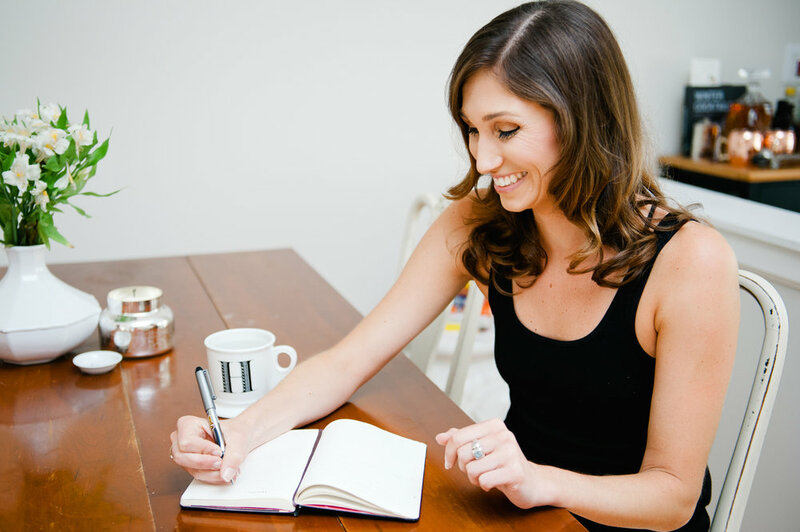 Have you heard of the Lagree Method? Or Megaformer classes? The Megaformer machine itself and the technique/method of class were both created by Sebastian Lagree in 2001. There are over 300 Megaformer locations worldwide. Your movements on the Megaformer are performed as slowly as possible. The concept of Lagree is that slow, controlled movement under constant tension leads to effective muscle stimulation. 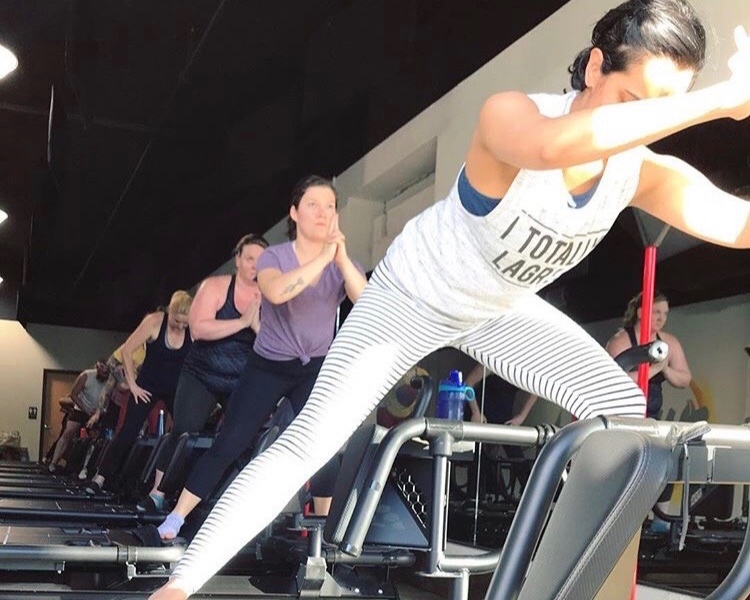 By keeping the muscles under constant tension, and transitioning quickly from one exercise to the next, you achieve a workout that is both cardio and strength training, from start to finish. The interesting thing about Lagree: is that you may have a studio in your hometown and not know it. Since Lagree licensed studios are not a franchise, they can vary by vibe, name, class offerings (etc.). I tried one in Charlotte called HSM Core, and LOVED it!. SLT s a VERY popular one in New York City and I plan to try it the next time I’m up there. Some studios mix the megaformer with a second piece of equipment like at Transform Colorado they mix it with the “versaclimber” and at Sculpthouse (in Atlanta) they add a treadmill. 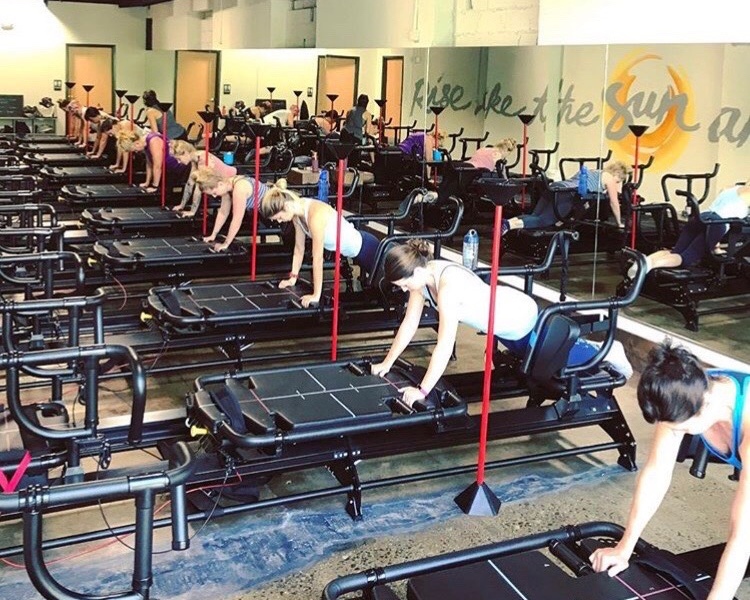 The Megaformer studio in Asheville (Scorch Fitness) is located in the River Arts District and I was secretly hoping you would choose this format for me to try first. The workout is awesome and the owners are the KINDEST and most amazing people I have met in Asheville. When I told them I was going to own a barre studio in town they welcomed me with open arms and asked if I’d like to collaborate with them. This is basically unheard of in the fitness industry which is known for being SO competitive. I was afraid they wouldn’t let me continue to take classes with them.. but instead we hosted a JOINT Pure Barre and Megaformer class last week! They really live the mantra "community over competition" and that's just so cool and inspiring to me! Have any questions for me? I am SO excited to get started! More to come very soon I promise! Have you started a cross training, or fitness related challenge for the New Year? Share below!